On August 17, news broke that Hong Kong actor/singer Jaycee Chan (房祖名) and Taiwanese actor Kai Ko (柯震東) were arrested for drug use in mainland China. Forty-six hours after the news leak, Jaycee’s father, Jackie Chan (成龍), took to Sina Weibo to issue his first public response and apology regarding the news. After the drug use scandal went public earlier this week, news sites erupted with reports about Jaycee and Kai’s history of drugs. Kai, who admitted to having been a regular marijuana user for the past two years, later broke down in tears in an apologetic video. Jaycee, who has been using the drug for eight years, had yet to reply, and neither father Jackie Chan nor mother Joan Lin (林鳳嬌) were available for comment. “First, thank you for the concern of all of my friends. I am extremely angry and shocked that such a thing would happen with my son Jaycee Chan! As a public figure, I am very ashamed, and as a father, I am very distressed. His mother especially is heartbroken. I hope teenagers will learn a lesson from Jaycee and stay far away from the violation of drugs. “Here, I also say to Jaycee: When you do something wrong, you have to face the consequences. As your father, I am willing to face the future with you. Since Jackie is a well-known public figure and an anti-drug ambassador, his shame over the news is understandable. Many netizens left consoling messages on Jackie’s Weibo, commenting that Jaycee is already an adult and should face the consequences of his actions himself, rather than letting his father suffer in his place. I think he responded well to the public. What can he do anyway? It’s too late to educate his son. It’s time for him to grow up and be responsible for his own action. But his father is not abandoning, instead they will face it together. Everything happens for a reason, and probably it will help to re-bond the family again. is okay to make mistake – just make sure we all learn from it and be a better person after. Well said and at least he is not abandoning his son. Hopefully this incident will make them all better people and strengthen their family bond. Jaycee Chan has had it too easy his whole life. Maybe it’s time for the parents to show some tough love? Start taking away some privileges (like whatever was funding his bad/drug habits, the house/condo that his friends love to party at, etc.). Make him “earn” his own habits. Parents shouldn’t fund his “bad” habits. Has he had it too easy? For one, he did have an absent father who can’t even remember his son graduated from I remember primary school to secondary school or something like that. Having a famous father is never easy when expectations are high. That being said, he shouldn’t have broken the law. He must face it like a man and from what I read, he did confess and even cooperated with the police. 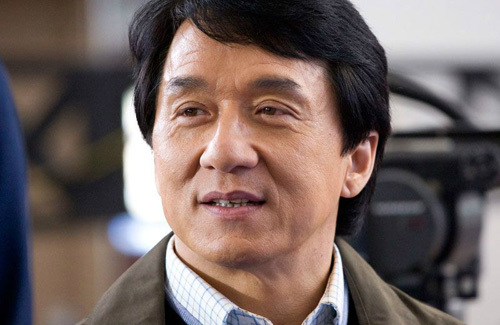 Well let’s hope Jackie Chan stands by his word and have his son face the consequences instead of pulling strings to get Jaycee a lighter sentence. did Mr Chan senior used to rile against the chinese peasants for having too much “freedom”..? i hope they put his son in a hard labour camp for re-education. Jaycee is 32 he is not a baby. I applaud the way Jackie has handled it and will stand by his son. In a way I do see Jackie’s statement and his actions in this scandal thus far rather classy in a way. Just send him for rehab. ..at 32 Jackie C. was already reaching his fame. Hope his son will go to rehab. Get help for his treatment. Rehab for marijuana? Are you stupid? Login or Register before you can reply to What? Eight years for being stupid and of course he needs help anywhere anytime. 😀 🙁 LOL! A very subdued and appropriate response, dispelling any cynicism that he may use his influence to get his son off. Jackie hired a new PR team? Well it sure looks like he hired the right PR team. Worth every penny! LOlL. He has no right to say he’s ashamed. Having a mistress and getting her pregnant and won’t man up is worst than what your son did. He has all the rights to say anything he wants. He is his father. Being unfaithful has nothing to do with parenting! Perhaps it’s true he didn’t teach him well, but, the fact is, he is still his and and vice versa, unless he disown him, then he has no rights to say anything. Give me a break. That lady is a horrible mother. She just wanted money, which she didn’t get, so she tried to get fame. At this point in her life she’s really not popular so besides trying to ruin Jackie’s reputation, which didn’t really work, maybe a little. But what’s the point in bringing the daughter out in the public for everyone to see. Maybe she did get money which is why she is silently raising her daughter. If she truly got nothing then I do not think she would just go silent so easily. Yup, he has all the rights to say about his son and also gives sh!t to the selfish wife of his. That’s one selfish b!tch. It takes one to know one. If you’re going to fry Jackie don’t forget to fry the selfish wife as well. 😀 🙁 LOL! Yup, some adults are stubborn as hell and so are the dame kids. 😀 🙁 LOL! Well to be fair, even if they did teach him well, whether he listens or not is a different story. I have seen great parents have bad kids and vice versa. What has happened has happened, so they must face the consequences now. Jackie did respond well. What more can he do now? At least he is not abandoning him and is trying to do all they he can to help his son. that mistress is a predator and hardly innocent. She’s now preying on a HK politician who happens to be older, rich and attached. His rejections aren’t a deterrent to her persistence. They all are. She’s no good but Jackie should have done the right thing with his daughter. It takes a pr!ck to know a b!tch. Joan has both of his balls and now is the time to turn the table on her for not doing her duties with her son. 😀 🙁 LOL! compared to Jackie’s misdoings, Jaycee is a lightweight. “Ashamed”? I didn’t know that he knew the meaning or existence of the word! It’s laughable that he thinks this is so serious when he has done 100000x worse. I am against drugs and drug use, but this really pales in comparison to what Jackie has done in his life. I also seriously doubt that he can claim a drug free life as well. pretty soon he’ll be accused of murder, embezzlement, larceny in an all-out kangaroo court. I used to like his movies a lot. To that extent I was disappointed when I discovered his real life personality and character. “It’s laughable that he thinks this is so serious when he has done 100000x worse.” The adjective “stupid” describes someone who do not have the ability to see the facts in front of him. That is my opinion of him now. As a public figure, the response was good. Jaycee is an adult so he should take responsibility for his own action. It’s only natural to feel disappointed and heartbroken when your son/daughter uses drugs. I dont think any parents would ever feel proud, hopefully the son is adamant to give up the addiction. In America, parents don’t feel disappointed at all if their children take drugs. Infact in many Americans families, taking drugs is a family affair. He has the means to employ a group of top-notch professionals to guide his son when he was younger towards some kind of business or in managing his vast assets, yet he did not. I think he’s too full of himself, thinking that Jaycee will be successful in showbiz (even without natural talent) because he is his son. Now Jaycee is neither here or there, & he’s already 32- with nothing to show for. He act like he didnt know, i bet he sell them to. His son hold frequent drug parties attended by over 100 celebs. I am very surprised Jackie does not know of it at all. I find it hard to believe. Lol marijuana is awesome. There is nothing to apologize for.